Pizzelle are thin wafer-like, crispy cookies made with eggs, sugar, flour, and usually anise (licorice) flavoring. “Pizzelle” literally means little pizzas, and named after their shape. In Italy, pizzelle may also be referred to by names such as ferratelle, nevole, neole, ciarancelle, cancelle, cancellette, catarette, scalette, inferrite… and more. 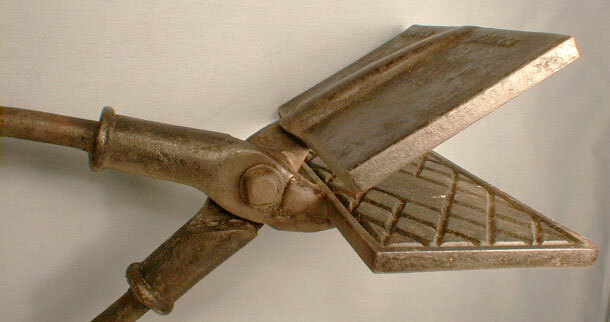 Legend has it that some poor blacksmiths of the Abruzzi region used old railroad nails and pieces of track to forge the irons that may have given the cookie its name, “ferratelle,” referring to the ferrous material. Even though their history is not clear, pizzelle irons were first documented to already be in widespread use in Abruzzo during the late 1700’s and early 1800’s. And there are reports that pizzelle may date as far back as the 8th century, called Crustule by the Romans. Pizzelle Recipe Hint: A standard batch of eggs refers to six eggs, making around 60 cookies, and taking about 45 minutes to 1 hour to bake. Be sure to refer to our expert Tips, to help you make perfect pizzelle, and avoid all the potential pitfalls. Melt butter on a low heat in a small sauce pan. Beat eggs in a large bowl and add vanilla essence. Add sugar to the egg mixture and beat well. After butter has melted, allow to cool slightly and then add to egg and sugar mixture. Sift in flour and baking powder into the wet mixture, stirring well to ensure all flour is completely mixed. The batter will be stiff. Bake using pizzelle iron. Full batch will make about 60 cookies. Melt butter, add sugar and beat well. Add egg yolks and vanilla and mix well. In a separate bowl mix the flour and baking powder and then gradually add to the butter and egg mixture. In a separate bowl beat the egg whites until stiff then fold carefully into the butter/egg/flour mixture. Spoon onto pizzelle iron and bake. Beat the eggs and sugar together in a large bowl then add the Crisco (or olive oil) followed by the baking powder and vanilla. Mix well and add the flour gradually to the mix. Once the ingredients are mixed well spoon onto iron and bake. Cream sugar and butter. Add eggs and cream well. Add flavoring then follow with baking powder and mix well. Refrigerate overnight before using. Beat eggs lightly. Add oil, anise seed and vanilla. Stir in sugar. Add sifted flour and baking powder and stir until mixture can be dropped from a spoon. If too sticky, more flour may be added. This recipe has been around since the beginning of the century, and has been enjoyed by the thousands upon thousands of our customers who have, over the years, purchased pizzelle irons from us. Beat eggs and sugar until they become light and foamy. Beat in the remaining ingredients as follows: Add the melted shortening, a little at a time. Add the anise seeds, vanilla, grated rinds and juices. Gradually add the flour until a light dough is formed; light enough to drop onto the iron with a spoon. You may have a little bit of flour left over. Not everyone can deal with the anise seed getting between their teeth. For you, we recommend pulverizing the seeds in your food processor, electric mincer or mortar and pestle. Or you can use the oil or extract for the traditional licorice flavoring of this cookie. By Barbara D’Addario, whose mother is famous for her pizzelle. Cream together margarine and sugar until light and fluffy. Beat in eggs, one at a time. Beat mixture vigorously. Add flour gradually, continuing to beat vigorously, until there are no lumps. Beat in the anise. The mixture should ribbon when dropped from a spoon. Bake until golden. 1. Use “I Can’t Believe it’s Not Butter” brand in place of butter or oil. 2. Replace half of the eggs called for with egg whites (for 3 eggs use 1 egg and 2 egg whites). Beat eggs and sugar together. Add cooled melted butter and amaretto (or almond extract) and almonds. Sift flour and baking powder and add to egg mixture. Batter will be stiff enough to be dropped by spoon. Will make approx. 30 pizzelle. NOTE: Ashley highly recommends using Amaretto and sliced almonds for the best result. The Amaretto gives the pizzelle a rich, unique taste while the sliced almonds seem to toast better than chopped almonds in the iron (because they lie flat in the finished cookie) and have a better crunchy, toasted taste. It is “essential’ that anise essence is used rather than the readily available anise extract. The flavor is simply not the same. The essence or oil can be obtained from a drug store, but they may need to order it. Anise oil has some medicinal uses and the pharmacist may ask what you intend to do with it. It is extremely concentrated so be careful when using. Prepare basic pizzelle dough, eliminating the vanilla and adding one drop of essence to the butter and egg mixture. Prepare basic pizzelle dough (you may eliminate the vanilla), adding 1-1/2 teaspoons anise seeds to the butter and egg mixture. Continue to follow recipe. She suggests trying these with a scoop of ice cream and a drizzle of chocolate sauce. thick and lemon colored. With mixer on medium speed, gradually beat in sugar and brown sugar. Beat in cooled margarine, milk and vanilla. Add flour mixture and beet on low speed till combined. Fold in pecans. pizzelle iron on range-top over medium heat till a drop of water sizzles on the grid. Reduce heat to medium-low.) Place a slightly rounded tablespoon of batter slightly off-center toward back of grid. Close lid. Bake according to manufacturers directions. (For non-electric iron, bake for 30 to 60 seconds or till golden, turning once.) Turn wafer out onto cutting board. While pizzelle is still warm, trim edges with a knife. Place on a paper towel to cool. Repeat with remaining batter. Makes about 40. The ingredients cardamon and orange are optional, but are a great flavor combination. Add all the above ingredients in a bowl with the melted butter. Mix until smooth. Drop by a teaspoon on a pizzelle iron. Bake until a light brown. The recipe for chocolate pizzelle is slightly different to the other flavored varieties, using more sugar and less baking powder. It is important to sieve the cocoa with the flour and sugar to ensure an even distribution of the powder. Melt butter. In a large mixing bowl mix eggs and vanilla. In a separate mixing bowl sift the flour, sugar, baking powder, and cocoa together. Once the butter has melted, allow it to cool then add to the egg mixture; beat together. Add the sifted flour mixture and mix well. Bake in pizzelle iron. NOTE: These cookies may take up to 15 seconds longer to bake than the plain batter. Because irons do vary, be sure to test and adjust your baking time accordingly, but take care not to over cook! Beat eggs and sugar together. In a separate bowl sift flour and baking powder together. Melt the butter and chocolate together. Use either a double boiler or use the absolutely lowest setting to very, very slowly melt this mixture. Add vanilla, almonds, and cooled butter/chocolate mix to egg mixture and mix thoroughly. Add flour to the the chocolate mixture and mix thoroughly. Makes about 30 pizzelle. NOTE: After making the dough, cover and refrigerate for about an hour then start making your pizzelle. This seems to give the pizzelle a little richer taste. Mix the eggs, sugar and salt together until light. Add melted butter and whisk together. In a separate bowl sift together the flour, sugar, baking powder, cocoa powder and cinnamon. Gradually add the sifted components to the wet mixture. Fold in the ground hazelnuts. Spoon onto pizzelle iron and bake. Stir together flour, baking powder, nutmeg and cardamom. In a small mixer bowl, beat eggs with an electric mixer on high speed about 4 minutes or till thick and lemon colored. With mixer on medium speed, gradually beat in sugar. Beat in cooled melted butter and vanilla. Add flour mixture and beat on low speed till combined. Heat pizzelle iron on range top over medium heat (or heat an electric pizzelle iron according to manufacturer’s directions) till a drop of water sizzles on the grid. Reduce heat to medium-low. Place a slightly rounded tablespoon of batter in the center of the round grid. Squeeze lid to close. Bake for 30-60 seconds or till golden, turning iron once. (For electric iron, you don’t have to turn.) Turn wafer out onto rack to cool. Repeat with remaining batter. Prepare basic pizzelle dough, adding 1 1/2 tsp. ground cinnamon to the flour mixture of a full (6 egg) batch. Continue to follow recipe. Stir together flour, cocoa powder, baking powder, and cinnamon. Beat eggs in small mixer bowl with mixer on high speed 4 minutes or till thick and lemon colored. Gradually beat in sugar on medium speed. Beat in margarine and vanilla. Add flour mixture; beat on low speed till combined. Add 1 cup shredded coconut to the egg, butter and sugar mixture of classic pizzelle recipe 1 (6 egg batch), using 2 Tbsp. coconut extract in place of vanilla. Continue to follow recipe. Originally from the Better Homes & Gardens magazine of 12/91. Stir together flour and baking powder; set aside. Beat eggs in a small mixer bowl with mixer on high speed about 4 minutes or till thick and lemon colored. With mixer on medium speed, gradually beat in sugar. Beat in cooled margarine or butter, an vanilla. Add flour mixture and beat on low speed till combined. Set aside 1/2 cup coconut; chop remaining coconut (should have 3/4 cup). Fold chopped coconut into batter. Place a slightly rounded tablespoon of batter slightly off-center toward back of grid. Close lid. Bake according to manufacturers directions. (For non-electric iron, bake for 30 to 60 seconds or till golden, turning once.) Turn wafer out onto a cutting board; cut into quarters. Transfer quarters to paper towel to cool completely. Repeat with remaining batter. Prepare Chocolate Glaze (see below). Dip the rounded edge of each quarter into glaze, then into reserved coconut. Place on rack till glaze is set. Makes 72 to 96. Chocolate Glaze: Stir together 1 cup sifted powdered sugar, 2 tablespoons unsweetened cocoa powder, and 1/4 teaspoon vanilla. Stir in enough milk (1 to 2 tablespoons) to make a glaze. Prepare basic pizzelle dough, adding 1tsp. dried ground ginger to the flour mixture of a full batch (6 eggs). You may eliminate the vanilla essence. *Amount of flour added depends on the desired batter consistency. Mix eggs and sugar (both the white and brown) together, add the spices and molasses and mix well. Add the melted butter, mix, then add the baking powder. Add the flour to the desired consistency, mix well. Bake on a pizzelle iron, however, take care not to overcook. The flavor is much better if they are baked and allowed to cool. The aroma from these cookies as they bake will have your mouth watering! Combine eggs, sugar, melted butter and honey together. Sift dry ingredients together and mix into the wet mixture. Bake on pizzelle iron. She sites the “Herb Companion” as her source for the recipe and recommends mixing the sugar and lavender flowers a few days ahead and store in an airtight container to give a stronger flavor and scent. Place the eggs, lavender sugar, butter, flour, baking powder and vanilla in a bowl. Mix until smooth and drop onto the pizzelle iron and bake. Transfer the pizzelle to a wire rack to cool and lightly dust with confectioners sugar. Eliminate vanilla essence and add 2 Tbsp. lemon extract and 2 tsp. lemon zest to the egg, sugar, butter mixture of a full (6 egg) batch. Continue to follow recipe. Beat eggs and sugar together. Add cooled melted butter and maple syrup and walnuts. Sift flour and baking powder and add to egg mixture. Batter will be stiff enough to be dropped by spoon. Will make approx. 30 pizzelle. Many different varieties of nuts can be used with excellent results, including: almonds, pecans, walnuts, and peanuts. Since nuts take up such a large volume, it is necessary to reduce the amount of flour slightly, otherwise they will be very thick. Prepare basic pizzelle dough, reducing the amount of flour by ½ a cup for a full (6 egg) batch. Chop one cup of nuts finely in a food processor and add to a basic pizzelle dough. If using almonds, try using almond essence in place of vanilla essence in the basic dough. Eliminate vanilla essence and add 2 Tbsp. orange extract and 2 tsp. orange zest to the egg, sugar, butter mixture of a full (6 egg) batch. Continue to follow recipe. Beat eggs and sugar. Add cooled, melted butter a little at a time. Add rum and grated orange peel. Gradually add enough flour to make a very light dough. Makes 50 pizzelle. In medium bowl, beat eggs with butter until blended. Stir in remaining ingredients until blended. With pizzelle iron, use batter to make pizzelle according to manufacturer’s instructions. Make pizzelle up to 1 week ahead of serving; 1/2 hour before serving, preheat oven to 250 degrees. Wrap pizzelle in aluminum foil; heat in oven until warm. Eliminate vanilla essence and add 6 Tbsp. smooth peanut butter to the egg, sugar, butter mixture of a full (6 egg) batch. Whisk until peanut butter is evenly blended. Continue to follow recipe, increasing the amount of flour by 1/2 cup. Prepare one batch of classic pizzelle batter and one batch of chocolate, adding 3 drops of red food coloring to the chocolate batter. Drop one half teaspoon of each batter onto each plate of the iron and bake. The result is a two-toned pizzelle cookie! Beat the eggs, then add remaining ingredients and blend well. Cook for about 30 seconds. The come out of the iron soft and stay soft. They have a nice, fruity taste when the juice is used. Makes about 8 dozen cookies. – Eggs: Obviously eggs come in several sizes and color. Be sure to use only large grade A eggs for the recipes listed at this site. – Use of an egg substitute: There are currently several “egg substitutes” available in either the dairy or freezer section of your local supermarket. They are great for baking as they avoid the obvious mess when using fresh eggs, and also allow for “reduced fat” recipe modification as they have the fat removed. In addition, they are cholesterol free. They can be replaced for fresh eggs, however, usually they are more expensive. Also, if using frozen egg substitute, please be very careful if you are defrosting them in a microwave. They can very quickly turn to scrambled eggs if not closely watched. Use a low power setting, like 30%, for short periods of time, such as 30 seconds. Ideally, leave in the refrigerator overnight before using for baking. – Vanilla Sugar: One of the best secrets to getting that great vanilla taste is to use vanilla sugar. Simply purchase a vanilla bean and place inside a storage container with about 2 or 3 pounds of regular cane sugar. Very quickly the sugar takes on the essence of the bean. In the past I have used vanilla bean from the supermarket available in a spice jar. Nothing compares, however, to the aroma a flavor from a bean obtained from a dealer in spices and herbs. Try your local farmers market or specialty cooking shop. It is worth the hunt! – Butter: When a recipe for pizzelle calls for margarine or butter, try to use grade AA butter if at all possible. The flavor will hit you immediately when used in pizzelle baking. Personally, I never use oil because it does not support the flavors of the other ingredients. In addition, use a good quality salted butter, and check for dates when shopping. Unsalted butter can be used, but the trace of salt makes a subtle difference to the experienced taste bud! Also, be consistent with the variety you use. There are differences in flavor between the many brands available. – Flour: Use only all purpose flour when making pizzelle, do not use self raising. Try using Wondra® flour if you like your pizzelle more on the thin and delicate side. – Chocolate: Try substituting cocoa powder with baking chocolate to obtain a richer flavor. – Storage of Batter: Once the batter has been prepared for the pizzelle it can be easily stored in the refrigerator for baking later. Cover the bowl in which the batter is in using plastic wrap and place in a refrigerator. Try to use the batter within 24 hours and ensure that there are no other “strong flavors” in the refrigerator, such as garlic or onions or mature cheese. When it comes time to bake, allow the batter to come close to room temperature by allowing it to warm up on a counter for about 15 to 30 minutes. The dough will spread nicely on the iron plates and cook much faster than if used straight from the refrigerator. – Don’t over load with batter: Less is definitely better than more! A smaller pizzelle will take on the shape of the die on the iron much better than one that has had too much batter added to it. Too much batter also results in some “over flowing” of the iron and can lead to a less-than-perfect pizzelle. – Use two cookie droppers: If you have never used a cookie dropper before you will thank me for introducing them to you! They resemble an ice cream scooper and hold about a tablespoon of batter. It will cut your cooking time in half. Guaranteed! If you enjoy making pizzelle, and make a lot of them, then try using a melon ball scooper. They are a lot stronger than a regular cookie dropper. They usually come in several sizes, however, the best one is the 1 3/8″ (or 36mm). This will not hold as much batter, hence the pizzelle will be smaller, but they will be worth the investment. After dropping the batter onto the iron, be sure to refill the droppers when one batch is cooking to save time when a batch is taken off the iron. – Try an ice cream scoop: Stainless steel portion scoops can help make your pizzelle all similarly sized, and, like the cookie dropper, will make depositing batter on the plates a faster process, especially for pizzelle bakers that make more than one at a time. For a standard 5″ round pizzelle, choose a #30 scoop if you like a little batter to overrun the edges of the pizzelle design so you could trim it perfect, or the #40 scoop for just enough batter to flow close to the edge of the design. And to diminish sticking, you can dip the bowl of your scoop in water between batter drops. – Try a pastry bag: Use a pastry bag without a tip to drop the pizzelle dough onto the iron. – Center the batter: The convenience of using a cookie dropper can sometimes lead to bad habits, such as not taking the time to center the batter in the middle of the plate of the iron. This will obviously result in a “lopsided” cookie, which may not be presentable when served to friends and family. Of course they can still be eaten, but if you have a few cookies which are not presentable there are several ideas below for using them in dessert making. – Use two irons at one time: If you plan to make two different pizzelle flavors at once, then consider using two different irons running simultaneously. Borrow one from a friend or relative and prepare both batches ahead. Then, take the phone off the hook, kick off your shoes, and sit down. It takes a lot of co-ordination and considerable effort to run two different irons at once, but for those challenged for time it can be the best way to get a job done, especially around holiday season. If the irons are of a different make then the patterns and texture may be different, so keep the cookies separated, even if they are of the same flavor. – Use a side plate: Try using this to hold the cookie droppers rather than have them rest on a table or counter surface or rest in the batter. It is cleaner than resting them on a surface, and are not “lost” in a large mixing bowl. – Use a LARGE Cookie Rack: As the pizzelle come off the iron, use a fork and transfer them to a cookie rack. This will allow them to cool much faster, so they can be transferred to a storage container, and so give you more space to work with. Pizzelle, like any other cookie, should be stored in an air-tight container to avoid becoming stale. However, their large size (about 5″ or 126mm) and fragile nature can make it difficult to store them in a convenient way. Here are a few solutions which work well. – Zip-Lock bags: Try using the larger 1 gallon size bags, they will not hold a lot of cookies, about 25 to 30, and are not suitable for traveling. They make up for this fault by usually having a convenient space for writing on! Be sure to include the date made and their flavor. – Plastic storage containers: Finding the right size can be difficult. A regular batch of pizzelle can make about 60 cookies, and usually needs two storage containers. Rubbermaid® make a 10 cup (2.4L) Servin’ Saver™ with the number 6 on the bottom which is very nice. However, if you need several because you are making different flavors, then another alternative is to try your local “dollar store”. Sometimes you can get lucky and find exactly what you need there. – Labels: If you enjoy making pizzelle and using your computer, then a great project is to use a printing or word processing program to make labels to attach to your storage containers. Take the time to make them special, using appropriate clip-art. Include the flavor, a space to enter the date made, and even personalize them with your name. Below is an example of what can be done with a little time and imagination (or in my case, a lack there of). Run off a whole sheet of your favorite flavors so that they are available when you need them. – Popcorn Canisters: They are a common sight around holiday season, and what to do once all of the popcorn is gone? Store lots of pizzelle of course. – Coffee Can: Try out a 39oz coffee can. It should hold from 10 to 15 cookies. – Cool Whip Containers: The perfect size for storing pizzelle, and the plastic container will allow a tight seal, keeping the cookies at their freshest. – Wonder Bread Bags: The bags are the perfect size for pizzelle and can hold quite a lot of cookies. – Paper Towels: I think most would agree that a crispy pizzelle is best. Store pizzelle between layers of paper towels to absorb moisture. This is a great idea if freezing or storing during the hot and humid months of summer. – Freezing Pizzelle: Yes! Pizzelle can be frozen, but wrap small bundles of cookies up with plastic wrap, then store in a large air tight storage container suitable for freezing. When you need a few cookies for a snack or when visitors come around, just take out as many bundles as you need. – To make cones for ice cream or other fillings, use a wooden shaping cone or a lady lock mold. While the pizzella is still hot and soft, gently wrap it around the cone. It will quickly harden to that shape. – To make cups, press hot pizzelle into muffin tin cavities. Allow the molds to cool before removing, then fill with ice cream, fruit, etc. – To make pizzelle pie slices, alternate 5 to 7 thin layers with pizzelle and pudding. Refrigerate overnight. Cut into pie slices before serving. – To make chocolate filled pizzelle tubes, quickly place a bunch of chocolate chips in the center of a hot pizzelle, and gently roll into a tube. The chocolate will melt, and harden again as it cools. Optional: Confectioners sugar, strawberry sauce. – Bring the cream cheese to room temperature. combine all ingredients in a food processor. Pulse just until well blended. If blended too long the cream will become too thin. Fill a pastry bag with the cream filling and pipe it into pizzelle tubes. Sprinkle chocolate chips on each end. Server plain, dusted with powdered sugar, or with strawberry sauce. – Mix sugar and cornstarch. Warm half and half and milk together. Gradually add sugar and cornstarch to milk, stirring constantly. When thick and smooth add orange peel and cinnamon stick. Continue stirring. When mixture is thick remove from heat. Remove cinnamon stick. Cool. Refrigerate over night. Fill shells next day after beating custard until smooth. Fill half of shell with custard and insert a small piece of chocolate in center, fill remainder of shell with custard. Dip each end of shell with grated toasted almonds. Sprinkle with powered sugar. Makes double batch. – Preheat pizzelle iron. Mix eggs, sugar and butter thoroughly in bowl. Beat in vanilla. Mix in flour and baking powder. Drop mixture by heaping tablespoons onto preheated pizzelle iron. Cook 30 seconds to 1 minute, or follow manufacturer’s directions. Remove with spatula to cookie sheet and let cool. Makes 2 to 3 dozen pizzelle cookies. – Soften spumoni by letting it sit in refrigerator 15 to 30 minutes. Take 1/4-cup scoops of spumoni and place them onto shallow baking pan lined with wax paper. Cover with a layer of wax paper. Press gently to flatten scoops to discs 3 to 4 inches in diameter. Freeze. – To assemble Spumoni Pizzelle Sandwiches: Top 12 pizzelle cookies with one disc spumoni each. Cover ice cream discs with another pizzelle, creating a sandwich. Press very gently so that pizzelle do not break. Return to freezer until ready to serve. If storing sandwiches for more than 1 hour after preparation, place them in freezer bag or freezer container. Makes 6 servings. – Beat eggs, add sugar, butter, brandy, baking powder, anise seeds and flour and mix well. Bake on hot pizzelle iron. Quickly remove the cookies with a fork and roll around a pizzelle cone while hot. Allow to cool, and fill with the mascarpone cheese filling. The recipe is intended to be served with mimosas, which can be prepared by combining 1/2 cup champagne and 1/2 cup orange juice in a glass. – Prepare berries by washing them and setting aside to drain. Slice strawberries in halves or quarters. Blend the mascarpone, the cream cheese and sugar to taste with a little milk to make a smooth sauce. Set aside Prepare original pizzelle cookies. Place a pizzelle cookie on a plate and top with the fresh berries and the mascarpone sauce. Serve immediately. – Slice the strawberries and saute in the butter and sugar for 2 1/2 minutes. Add the liquor and reduce. if you do not flambe it, remove the pan from the heat BEFORE your add the liquor. Otherwise remove the pan, add liquor and ignite the pan. – Place one pizzelle cookie (or a think slice of pound cake) on each plate and add one or two scoops of ice cream on top. Cover with another layer of pizzelle (or cake). Stick a sprig of mint into the ice cream on the side. Spoon the strawberry flambe around the ice cream (or cake). Try making an ice cream sandwich with your favorite flavors of pizzelle and ice cream. They are delicious! Place a small amount on confectioners sugar in a sieve and lightly dust pizzelle. Transfer to serving dish for a very elegant desert. Try using a ricotta based filling between two pizzelle, or use it to fill a rolled pizzelle. Blend 1 cup ricotta cheese (drain if too wet) with ½ cup confectioners sugar and 1 Tbsp. vanilla extract, and a dash of ground cinnamon. Or create a filling to complement the flavor of pizzelle made, for example, add a tablespoon of ground hazelnuts to the filling and eat with chocolate pizzelle. Try spreading peanut butter on one pizzelle and grape jelly on another and make a great PBJ sandwich. Add honey to a baked pizzelle and then add chopped walnuts, pecans, raisins or shredded coconut. – For a lighter batter, use cake flour instead of all-purpose flour. It can be refrigerated to be used at a later time; usually best, however, when used within 24 hours. Allow refrigerated batter to come to room temperature before using. – Bake when humidity levels are low. High humidity in your kitchen can be an important factor when baking, and can cause the best seasoned irons to stick. 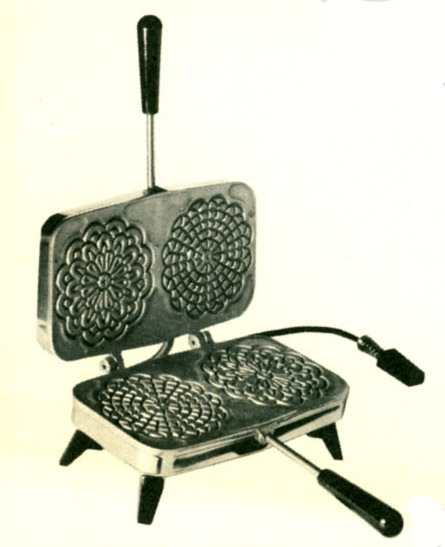 – Make sure the pizzelle iron has heated properly, about 5 to 10 minutes or per the manufacturer’s instructions. – If the iron has a non-stick coating, do not season. We do recommend a light spray of a vegetable oil. – For irons with a metal surface, we recommend seasoning before each use by lightly brushing both plates evenly with melted shortening, using a regular pastry or basting brush. An alternative method is to take two slices of white bread, spread shortening on both sides of each slice, and bake in the pizzelle maker. Then discard. – Spoon batter on the plates in the old fashioned way with a spoon, or use a cookie dropper, portioning (ice cream) scoop, or even a large pastry bag. – The first pizzelle baked on metal-surface irons may stick. Clean off the plates and re-season. – Too much oil (or grease, shortening, etc.) in your recipe may cause some of it to run out. Keep a moist towel handy to wipe up as needed. – Centers of bottoms usually turn out slightly darker, as the batter starts cooking the moment it lands on the hot surface of the pizzelle iron. Avoid this by working quickly in placing the batter on the surface and closing the lid. A #40 ice cream scoop will keep the batter inside the a standard pizzelle design; a #50 makes the batter overflow a bit, so you can afterwards trim to a perfectly round shape. – Remove baked pizzelle with a heat resistant tool without sharp edges. – After baking, clean the plates using a stiff nylon bristle brush for non-stick surfaces, and a light-wire brass or steel bristle brush for uncoated metal surfaces (or run a fork point around the design grooves) to remove stuck-on batter. Then clean with cloth or paper towel. – While still hot, place it on its sides, open like a book, over paper towels or newspapers. The heat keeps the oils fluid, so they’ll slide off the plates and out of the bottom tray. – After the unit cools, place a paper towel between the plates before storing. Store the pizzelle maker in its box, in a cool, dry place. First, you should know that you will find it easier to use a stovetop pizzelle iron with good results, if you adapt the ingredients of your batter recipe to create more of a dough. Often, you can do this by simply adding flour. Batters generally give you a lighter tasting pizzella, so experiment with your recipe. To season the iron, coat the plates with a vegetable oil and heat on the stove for 5-10 minutes. Flip the iron every minute or so, to heat both sides evenly. If using a dough recipe, roll pieces into small balls before placing on the plate and squeezing the handles shut. Start small to avoid a mess on your stove. Attach the handle clip to bake the pizzelle evenly thick. For the first few pizzelle, add the batter or dough and cook for about 1 minute, turning the iron over every 15 seconds or so. As the iron gets hotter during baking, pizzelle will bake faster. Throw away the first few pizzelle, as they will have soaked up the excess oil from the seasoning. Baking time will also vary from between about 20 and 60 seconds based on the temperature output of your burners. The direct heat of gas burners is generally hotter than the indirect heat from electric burners, but either will work well with a little patience and experimentation. If too hot, they bake unevenly; if too cool, they’ll stick if you peek. After baking, remove stuck-on food while still warm, and wipe surfaces with a cloth. Lightly oil the steel handles, to prevent them from rusting; if they rust, a light sanding and a little oil will restore their finish. Hilary (Versgali or Versagli) collected a lot of the wonderful recipes and really helpful hints that appear on this page, and authored a website on Pizzelle until 2005. We archive them here so they will not be lost to history. We are grateful for Hilary’s hard work in compiling them, and hope you will enjoy trying them all.